The Greeks may have been the first people to give us a clear image of the citizen in any politically intelligible sense of the term. Tribal people form social groups – families, clans, personal and community alliances, sororal and fraternal clubs, vocational and totemic societies, and the like. They may assemble regularly to examine and decide communal affairs – certainly a nascent form of politics – but the issues that confront them rarely deal with ways and means of governing themselves. Custom plays a paramount role in establishing their norms for community management; discourse beyond direct argumentation, occupies a place secondary to the enormous authority of precedence and long-established administrative procedures. Nor is this approach to be disdained as trivial or ”primitive”. Group safety and stability require that the community preserve the old, well-tested ways of life, of expeditiously applying and modifying time-honored and secure structures of group management. The kind relationship forms the social tissue of this governing body, whether the blood tie be real or fictitious. Religious belief, too, may place a very important role, as Fustel de Coulanges has argued. But politics as a creative and rational arena of discourse with its vastly innovative possibilities for shaping and bonding widely disparate individuals is only latent in tribal assemblies. It still has a domestic character with powerful familial biases that exclude the stranger. Tribal assemblies of preliterate peoples invoke the past; political assemblies of free citizens create a future. The former tends to be highly conservative; the latter highly innovative. If the two were juxtaposed with each other, we would be obliged to contrast custom to reason, precedent to a sense of futurity, kinship ties to civic ties, mythopoeia to ethic. In waxing enthusiastically over the popular assemblies that existed very early in Mesopotamian cities, Henri Frankfort declared that the assembly form ”is a man-made institution overriding the natural and primordial division of society into families and clans. It asserts that habitat, not kinship, determines one’s affinities. The city, moreover, does not recognize outside authority. It may be subjected by a neighbour or a ruler, but its loyalty cannot be won by force, for its sovereignty rests with the assembly of its citizens. The Greek citizen ideal, however, differed very profoundly from the modern. It was not simply some specious myth of shared heredity that united citizens of the polis with each other but a profoundly cultural conception of personal development – the Greek notion of paideia. Paideia is normally translated into English as education, a term that is notable for its sparseness and limitations. To the Greeks, particularly the Athenians, the word meant considerably more. The education of a young man involved a deeply formative and life-long process whose end result made him an asset to the polis, to his friends and family, and induced him to live up to the community’s highest ethical ideals. The German word, Bildung, with its combined meanings of character development, growth, enculturation, and an well-rounded education in knowledge and skills, more appropriately denotes what the Greeks meant by paideia than any word we have in English. It expresses a creative integration of the individual into his environment, a balance that demands a critical mind with a wide-ranging sense of duty. The Greek word, arete, which in Homeric times denoted the warrior attributes of prowess and valor, was extended by the classical era to mean goodness, virtue, and excellence in all aspects of life. Paideia and arete are indissolubly linked – not as means and ends but as a unified process of civic – and self-development. Excellence in public life was as crucial to an Athenian’s character development as excellence in his personal life. Politics, in turn, was not only concerned with administering the affairs of the polis but also with educating the citizen as a public being who developed the competence to act in the public interest. Paideia, in effect, was a form of civic schooling as well as personal training. It rooted civic, commitment in independence of mind, paideia, and a deep sense of individual responsibility. The modern notion of ”politics” as a form of managerial ”efficiency” or of education as the mere acquisition of knowledge and skills would have seemed pitiful to an Athenian citizen of classical times. Athenians assembled as an ekklesia not only to formulate policies and make judgements; they came together to mutually educate each other in the ability to act justly and expand their civic ideals of right and wrong. The ”political process”, to use a modern cliché, was not strictly institutional and administrative; it was intensely processual in the sense that politics was an inexhaustible, everyday ”curriculum” for intellectual, ethical, and personal growth – paideia that fostered the ability of citizens to creatively participate in public affairs, to bring their best abilities to the service of the polis and its needs, to intelligently manage their private affairs in accordance with the highest ethical standards of the community. The ”calling” to civic and personal excellence was more than a family responsibility or an institutionalized form of personal training. By classical times, Athenians who could afford them had tutors aplenty – rhetoricians to teach them the arts of persuasion; philosophers and logicians to instruct them in wisdom and consistency of thought; elders to provide them with the inherited lore of their families, civic traditions, and models of behaviour; gymnasia in which to train and control their bodies or learn material arts; courts to shape their faculties for judgement; and, in time, the ekklesia in which to formulate crucial policies through discourse and debate. But every polis, be it a garrison-state such as Sparta or a democracy such as Athens, provided a variety of public spaces in which citizens could gather on more intimate terms, often daily, to discuss public and private affairs. Perhaps the most important of these spaces, the agora, which M. I. Finley calls the ”town square”, was an informal meeting ground in which the people could be assembled when needed. By Perikles’ time, the Athenians were to shift the formal assembly of the people – the ekklesia – to a hillside (the Pnyx), but as Finley notes, the agora originally meant a ”gathering place”, long before it was invaded by shops, stalls, and templates. The agora provided the indispensable physical space for turning citizenship from a periodic institutional ritual into a living, everyday practice. Home was the place in which one ate, slept, and tended to the details of private life. But the Greeks held this private world in small esteem. Life was authentically lived in the open public space of the agora, where the citizens discussed business affairs,. gossiped, met friends – new and old – occasionally philosophized, and almost certainly engaged in vigorous political discussion. Perikles could be waylaid there by badgering critics as surely as Sokrates could be drawn into lengthy discussions by the intellectually earnest young nobles of the polis. Jugglers, acrobats, poets, and play-actors mixed with tradesmen, yeomen, philosophers, and public officials, a crowd spiced by strangely consumed visiting foreigners who gawked at the looming Acropolis above and the superbly adorned public buildings nearby. The flow of ideas from the independence of a mountain-dwelling villager to the egalitarianism of a polis-dwelling citizen must be seen as an unbroken continuum. The Greek language itself is magnificently processual and organic. A crucially important word such as arche, from which an entire political vocabulary has been constructed, denotes the originating principle as well as the ordering principle of any kosmos, the Greek word for ”order” without depriving it from its original and, hence, the latent possibilities that it could fulfil is linguistically built into the Greek mind – and also provides us with an important clue to the language’s ethical trust. Origin, history, fulfilment, and possibility – all form a unified whole in Greek, so that whether we choose to speak of the universe, humankind, the polis, or the citizen, these concepts, charged with ethical meaning, denote the unity of civic, natural, and social life or what we call ”correctedness” today. Accordingly, autarhcies or self-sufficient communities lead us organically – deductively, if you will – to independence, competence, and isonomia. The Greek polis has its arche in this germinal phasing of a highly competent farmer who, by an immanent process of socio-political development, found his fulfilment as highly-competent citizen. The old Greek aristocracy was no mere anachronism in this process. 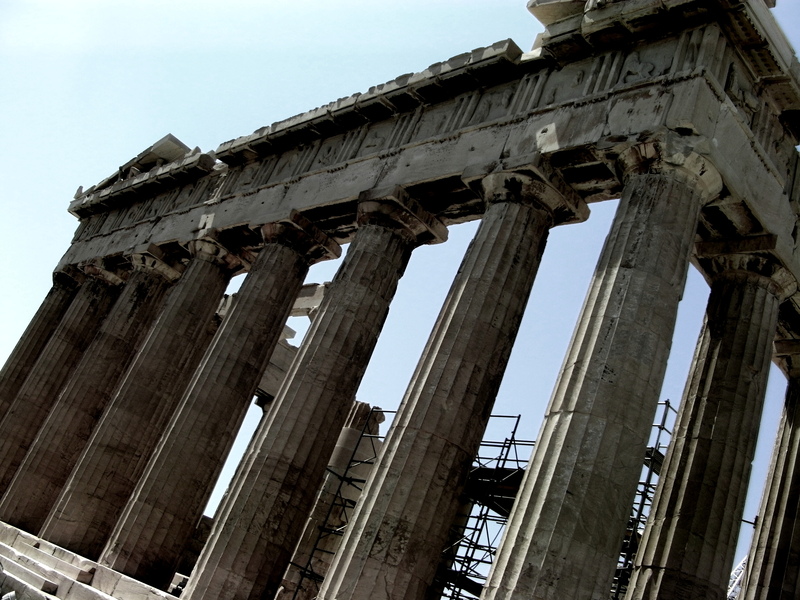 The Athenian democracy did not shed it; rather, it tried, with qualified success, to absorb it. Its epic culture, gospel or valor, high sense of philia, and code of honor, marked by a disdain for material things, were incorporated into the puritanical virtues of the democracy, which abjured luxury, ornateness of dress, culinary delights, and self-indulgence. The democratic hero was not only valorous but sternly self-willed and emotionally controlled. Warrior manliness did not die; it was reworked into civic loyalty, personal dignity, and a high regard for virtuous behavior. The comradeship of the military camp became the isonomia of the ekklesia in which human worth was seen as virtually interchangeable. Citizens were expected not only to be competent but to be competent equals. Hence, all could participate in the governance of the polis on the same footing, a practice which, as we shall see, was translated into the widespread use of sortition and attempts to arrive at decisions by consensus as well as by voting. It is worth emphasizing that nearly all the men who turned Athens from an aristocratic oligarchy into a democratic polity were of noble lineage. Solon, Kleisthenes, and Perikles, to cite the most well-known figures in forming the democracy, were members of the most elite clans, the genos, of Attica, the territorial domain of Athens. In cont4rast to their Roman counterparts, however, they did not become the leaders of an unruly partes populares, nor did they try to rise in an oppressive hierarchy by throwing away their fortunates in gifts to a debased urban mob. They were commonly men of exceptional distinction who could be as heroically selfless in political causes as their ancestors were heroically valorous in military ones. As Werner Jaeger was to point out, Athens did not destroy its aristocracy but rather tried to turn its entire citizen body into one. … the Athenian citizen was not a corporate being in our usual meaning of the term. Most present-day discussions of the Athenian’s lack of individuality and the polis’s tendency to subserve his personality to an overbeating collectivity are weighted down by Eurocentrically neurotic images of the individual as such. The modern identification of individuality with egotism and personality with neurosis has been overindulged under the rubric of ”modernity” with an arrogance that bears comparison only with the conceited claims of psychoanalysis and psychohistory to explain the human drama in all its aspects. The human beings can be individuated in different ways – some as highly social and political beings, others as private and self-indulgent beings, still others as combinations and permutations of both -is an alien to the claims of modernity as it is to the admirers of Gemeinschaft, the stagnant folk community based on kinship and organismic relationships. To the Hellenic citizen of a polis, leaving all its mythic origins aside, the monad would have seemed as a prehuman as the folk community seemed prepolitical. Individuality meant citizenship. And, ideally, citizenship means the personal wholeness that came from deep roots in tradition, a complexity of social bonds, richly articulated civic relationships, shared determination through institutions that fostered the full participation and everyday practice of a creative body politic. To be such a citizen, one had to live in a polis – a city that possessed an agora, a space to convene general assemblies of the people, a theatre to dramatize the reality and ideology of freedom, and the ceremonial squares, avenues, and temples that gave it reverential meaning. To remove any of these elements that made up this whole was to instantly destroy it. Without every one of them, cultivated on a daily basis by the paideia of citizenship fell apart and its institutions became hollow forms.